Down by the river: Rosettes at Great Northern Quilt Show Harrogate. Rosettes at Great Northern Quilt Show Harrogate. ﻿﻿﻿Last Thursday evening I got a lovely phonecall to say that "Just Doodling" had won the wholecloth award at the Great Northern Quilt Show. I had great plans to go over there on Sunday but unfortunately life got in the way and I missed it so I never got to see the show or my quilts. 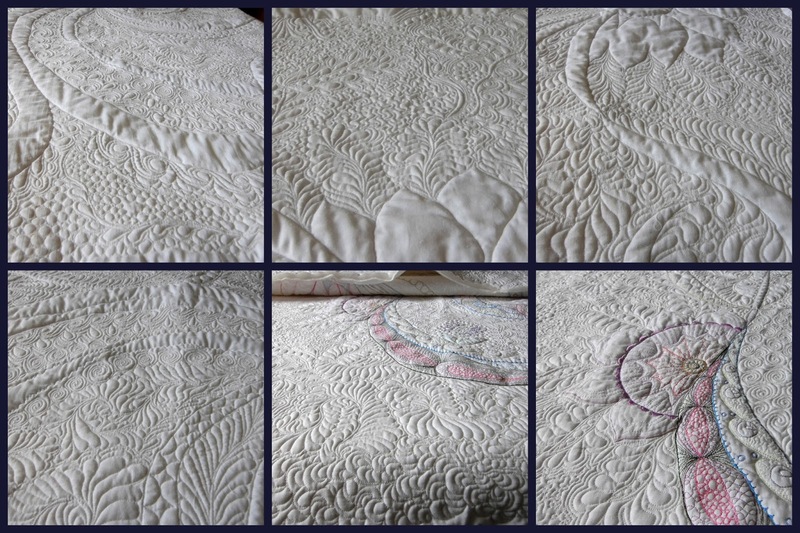 This is a photo I took when it was just finished and some pictures of the quilt in progress. Fantastic! Well done - they look as though the prizes are well deserved! I particularly like the wall one. Well done. Love the doodling quilt. Congratulations. I missed the show this year too. Absolutely stunning Ros. Did you win anything good or just the rosettes? Dis you win something nice? Congratulations,,,if the Doodle quilt ever needs rehoming I'll send you my address. Well done, it certainly looks like it deserved it! Congratulations on your well-deserved wins!